Organisers of Expo 2020 Dubai have celebrated a key milestone in preparation for the event, with pavilions for some participant countries reaching above-ground level. The pavilions, which are located in Expo’s three themed districts – Opportunity, Mobility and Sustainability, are the first structures to reach above-ground level on the 4.38 sq km site. Some of the pavilions at Expo 2020 will be built by countries themselves while Expo is constructing others to be rented. 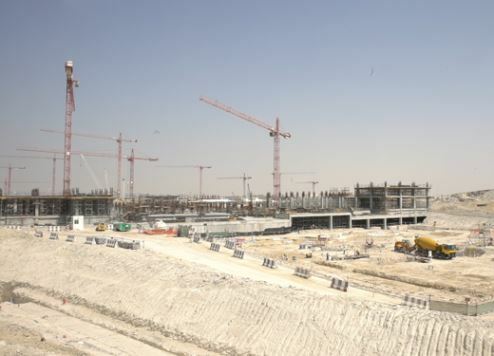 Work on the districts began in March after Dubai-based Al Futtaim Carillion was awarded an AED2.2 billion contract. Ahmed Al Khatib, vice president of Real Estate and Delivery at Expo 2020 Dubai, said: “The first superstructure – buildings that have reached above-ground level – to emerge in the theme districts marks a key milestone in our journey to Expo 2020. It is an exciting period because these are areas of the Expo site that will be experienced and enjoyed by millions of people from around the world. Expo 2020’s theme districts will contain a total of 136 pavilions for countries, NGOs and commercial partners, while dozens of other ‘self-built’ country pavilions will be erected outside the theme districts. Pavilions will house a wide range of exhibits and experiences to entertain, educate and empower the millions of people expected to visit the Expo. Every building in the theme districts will meet at the least the prestigious LEED Gold standard for sustainability. During Expo, the completed basements will become an underground rail and road network, supporting logistics to ensure pavilions, shops, restaurants and cafes are restocked and cleaned throughout the day without disrupting the experience of the visitors. The pace of development across the Expo site is accelerating now that the main construction phase is underway, Al Khatib explained. “We already have 17 different projects underway and more will be coming on stream in the next few months, particularly from April 2018, when participant nations begin to take over their plots and start constructing their pavilions,” he said.